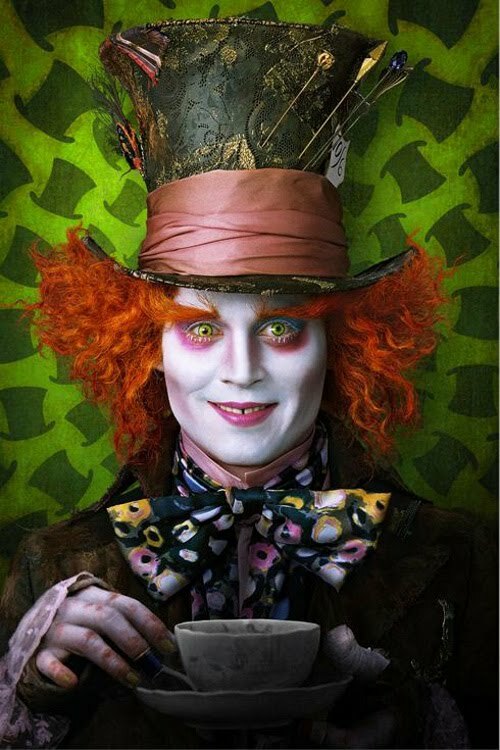 Or, as it should've been called: Tim Burton and Johnny Depp's "Wonka in Wonderland." BURTON: Johnny, I'm going to, uh, direct an "Alice in Wonderland" movie. DEPP: Jesus, you haven't already? BURTON: No, I guess I haven't! Do you want to play the Mad Hatter? DEPP: YES! I already have an idea about what I'd like to do with the character. BURTON: Great. Let's hear it. DEPP: OK, we keep the top-hat, right? But we give him crazy hair, make him really pale, and have him act super gay! BURTON: Brilliant. Wait... isn't that exactly what we did with Willy Wonka? DEPP: No, no, this will be totally different. DEPP: Because, man, the top hat will be, like WAY bigger! And... and I'll be even paler! Like PURE white, man, and I think we could go MUCH crazier with the hair too. DEPP: Wait, you know what? Let's make it so that, like, even though he ACTS totally gay, you also get the feeling that he wants to bang Alice. DEPP: And, like, add these weird little implications that he's kind of wanted to since she was a little girl. BURTON: YES. This sounds like a perfect take on the character. DEPP: He's going to be so pale and gay! BURTON: We rock. Hey, I even have an idea about what movie I want to do after that. It's called "Abraham Lincoln: Vampire Slayer." DEPP: Hey... didn't Abraham Lincoln wear a top hat? DEPP: I know JUST how I want to play him! ...and scene. Poor Lewis Carrol must be rolling over in his grave. Well, except for the bit about the implied pedophelia. I think he'd be down with that. 1) Take him to a Dreamworks animated movie. 2) Make him sit through the whole thing. 3) Tell him if he misbehaves, you'll do it again. The commercials for Shutter Island beg the viewers not to give awayt the shocking twist ending: That Shutter Island is a crappy movie. Like we couldn't guess that from the previews. I take it form its conspicuous absence that you totally ARE going to go see "Hot Tub Time Machine."